Check out Tobi's Snap Out Of It Drawstring Sweatpants We know what you like, and that's versatility, and here it is on display in our Snap Out of it Black Drawstring Sweatpants. These wide leg pants will flatter anyone. These soft cotton knit pants offer daytime comfort but turn on the strobe lights for dinner out with friends and those hot pants will be what everyone is talking about! The casual glam of this combo will have all eyes on you. We know what you like, and that's versatility, and here it is on display in our Snap Out of it Red Drawstring Sweatpants. These wide leg pants will flatter anyone. These soft cotton knit pants offer daytime comfort but turn on the strobe lights for dinner out with friends and those hot pants will be what everyone is talking about! The casual glam of this combo will have all eyes on you. We know what you like, and that's versatility, and here it is on display in our Snap Out of it Black Drawstring Sweatpants. 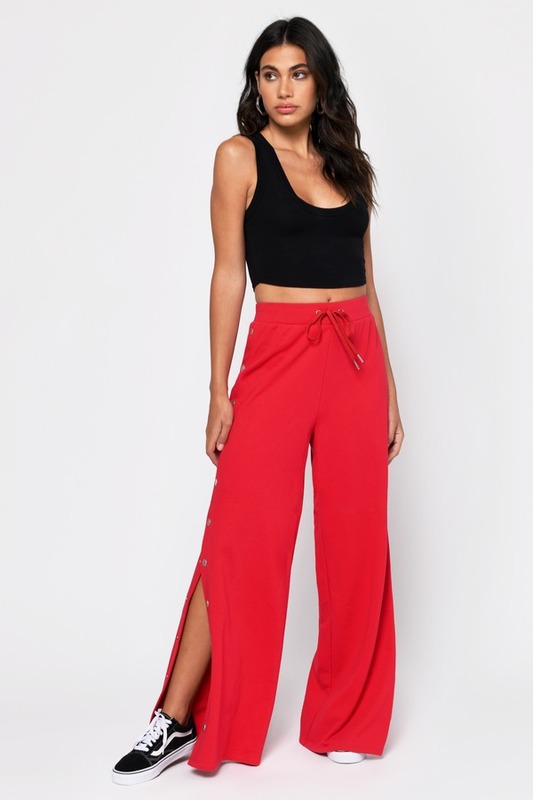 These wide leg pants will flatter anyone. These soft cotton knit pants offer daytime comfort but turn on the strobe lights for dinner out with friends and those hot pants will be what everyone is talking about! The casual glam of this combo will have all eyes on you.